Walvis Bay lies 30 kilometres south of Swakopmund, which in turn is 270 kilometers west of Windhoek, the capital of Namibia. The town derives its name from a lucrative whaling industry in the previous century (Walvis is the Afrikaans name for whale). 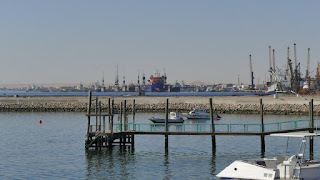 Today Walvis Bay is a large, modern, busy harbour town and Namibia’s only port. The bay is a safe haven for sea vessels because of its natural deepwater harbour, protected by the deep-sea sand bank at Pelican Point near the tip of the peninsula. On a clear day one can see the black-and-white lighthouse which also marks the location of a luxury lodge. The B2 approach road from Swakopmund is a beautiful ocean road flanked by mighty sand dunes of the Namib desert to your left. The town is centred around the modern harbour terminal where most local people are employed. 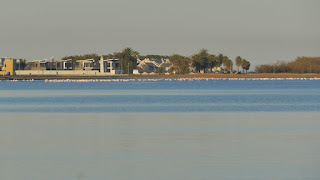 Just south from the harbour’s perimeter is a wide lagoon with innumerable sea birds, pelicans and flamingos. Luxury houses borders onto the lagoon with its well maintained open walk ways, grass surfaces and palm trees. The southern boundary of the newly proclaimed Dorob National Park is just south of Walvis Bay. The park covers over 780,000 hectares and includes the coastal dunes and gravel plains between the Swakop River and Sandwich Harbour, excluding proclaimed urban areas. Rainfall is sporadic and averages about 15 mm per year, making Walvis Bay one of the driest cities on the planet. Fresh water is derived from water wells and boreholes sunk in the Kuiseb river, as well as desalination plants from sea water. 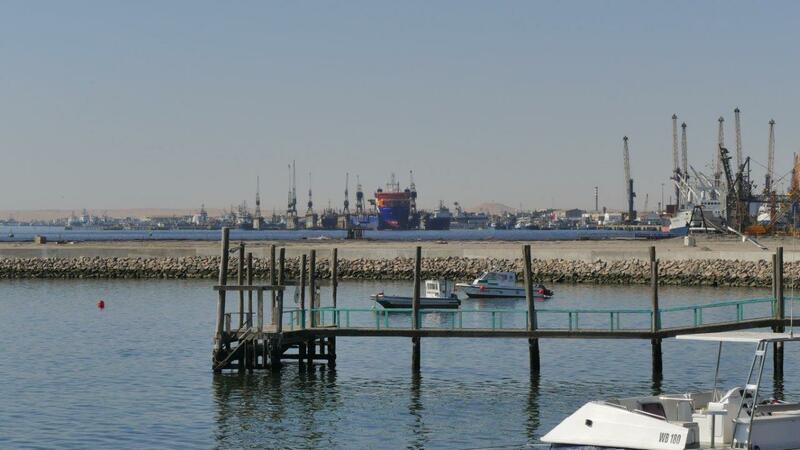 Despite the fact that it has an arid climate, Walvis Bay seldom gets very hot or very cold. Walvis Bay became part of the Union of South Africa in 1910 and remained under South African control until 1994, three years after Namibia became independent. The solar evaporation processing of sea salt is another major industry for Walvis Bay. The salt fields cover an area of 3,500 hectares just south of the lagoon. Annually it processes 24 million tons of sea water to produce 700,000 tons of high quality industrial salt. The majority of the salt exported through the port of Walvis Bay is used in the production of chemicals and mining explosives. 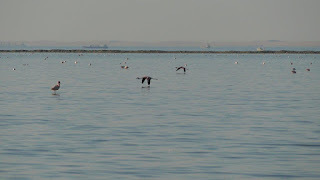 The Walvis Bay saltworks operate within a Ramsar wetland site area and forms an important element in the conservation of birdlife in the area. The artificially flooded evaporation ponds of the saltworks reduce the tidal sweep and possibly adds to increased siltation. Nutrients found in the ponds sustain a variety of wetland birds such as flamingos and other waders. The thousands of flamingos and other birds present are testimony to this. 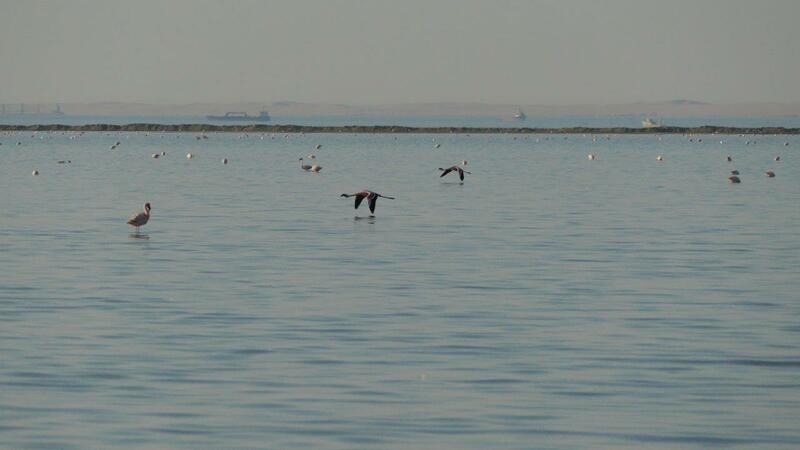 Walvis Bay became one of Namibia’s first Ramsar wetlands on 23 December 1995. The site consists of the natural areas of Walvis Bay lagoon, about half of the Pelican Point peninsula, and the adjacent intertidal areas. 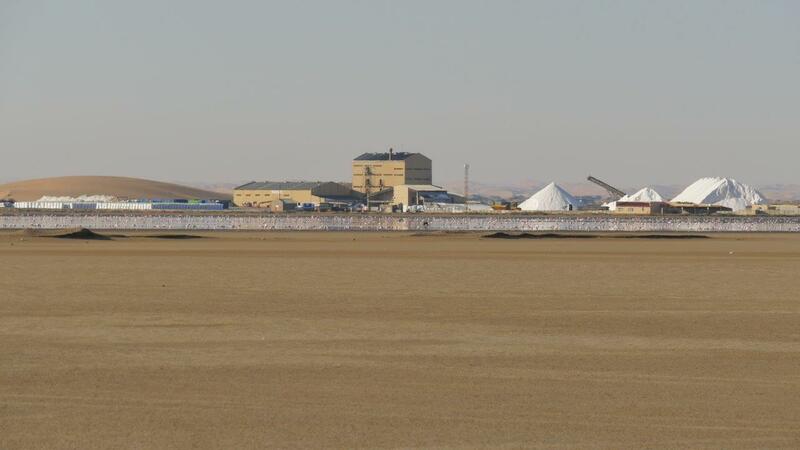 It also includes the Walvis Bay saltworks and areas to the south of it, covering a total of 10,550 ha. The entire wetland and surrounding area falls within the Dorob National Park. Walvis Bay is a bird watcher's paradise due to the mudflats and lagoons sheltered from the open ocean by a sand spit at Pelican Point. According to Birdlife International, this is the most important coastal wetland in southern Africa, and is probably one of the three most important coastal wetlands in Africa in terms of numbers and species of birds. Birds such as cormorants, pelicans, chestnut-banded plovers and especially flamingos (lesser and greater) are the obvious stars of the show. The area regularly supports over 100,000 birds in summer and more than 50,000 in winter. Most birds which use the wetland in summer are non-breeding intra-African and Palearctic migrants, with flamingos making up the majority of the numbers. Between 80–90% of the subregion’s flamingos winter here, utilizing especially the evaporation ponds of the saltworks. 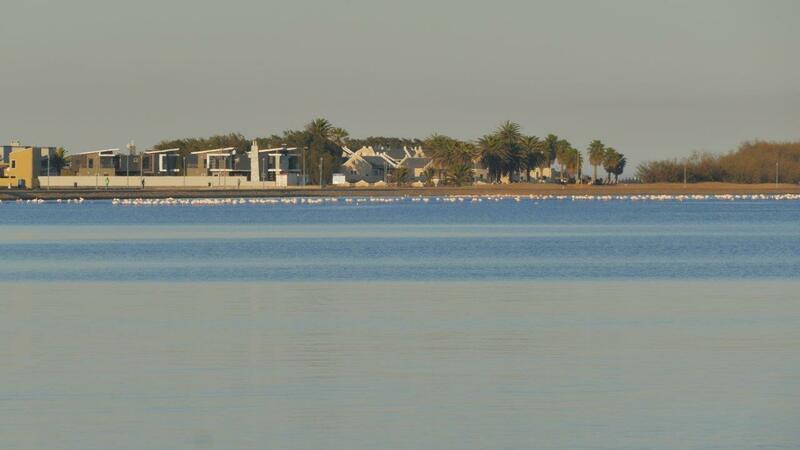 A good introduction to the birdlife of Walvis Bay is the harbour tour where you will see masses of cormorants, pelicans and herons. Then go on a self-drive tour to the lagoon and saltworks, or use one of the many boat and 4x4 tour operators, to see the thousands of lesser and greater flamingos. Bird Paradise at the sewage works just outside Walvis Bay on the C14 road, is another popular birding spot. Walvis Bay, with its large bay and sand dunes, is an important centre of tourism activity in Namibia. The lagoon is the scenic feature, and as mentioned above, one of the most important wetlands of southern Africa supporting thousands of migratory birds. There is a pedestrian walkway along the eastern shore of the lagoon for walking, cycling, or from where you can photograph the masses of flamingos. 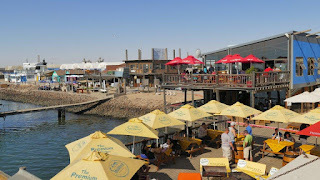 Walvis Bay has its own waterfront next to the Yacht Club, with many restaurants, cafés and pubs as well as good and varied accommodation options – from camping to luxury hotels. 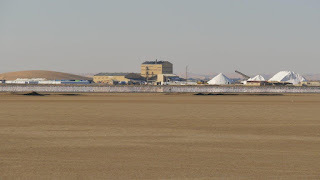 Other attractions include the artificial Bird Island, centre of a guano collection industry, the famous Dune 7 sand dune, the salt works, and the local museum in the Civic Centre. Walvis Bay is indeed a “bucket list” destination, even for non-birders. It is well suited for the outdoor lifestyle, boasting sports such as dune riding with quad bikes or 4x4 vehicles, sandboarding, kiting, surfing, swimming, angling, sailing, golf and other indoor and outdoor sport codes.